Codecs are software that enable your devices (Camera, Editor, Player) to perform video encoding and/or decoding (think video compression and de-compression). All these Codecs are based on standards (often de-facto company standards). All video streams are embedded in multimedia (video) containers. It is a common misconception that .AVI (Windows) and .MOV (Quicktime on Macs) already define what kind of video format it is. These containers include information which Codec is used in the file. If your system does not have the proper Codec installed the movie won't play. We want to use a codec that captures the highest quality possible balanced with the data volume our cameras can handle. Here are some codecs used in HDSLRs and pro video cameras. Simple Codec that is not very efficient in terms of a good balance of size and quality (non GOP Codec). H.264 uses a GOP encoding method. This is not really a top recording format. The proper domains for H.264 are the output and player devices. This said H.264 is quite a usable compromise for getting reasonable quality in relative small files. Canon HDSLRs use this codec in a .MOV container. Also a GOP based Codec. Used by Panasonic GH1/2, GF1, AF-100, TM700 and also the Sony NEX-5 and VG10. It is very important to check the bit rates used. The GH1 uses by default 17 Mbit/s and this leads to artifacts called 'Mud' (severe loss of detail in low contrast areas). Going up to 24 Mbit/s already improves the quality (used in VG10, GH2 and AF100). Actually AVCHD (standard by Sony/Pansonic and also used on some consumer video cameras by Canon) at it's core uses the same H.264 Codec. The main difference is the packaging (container) of the data. AVCHD is a format created for consumer camcorders. The structure actually mimics the basic structure of Blu-ray. Some TV sets and Blu-ray players can play these clips directly from the SD-Cards. For editing only the .MTS files in the STREAM folder are needed. They actually contain a H.264 video stream (some tools like ClipWrap on Macs can re-wrap these streams to .MOV without changing any data). On Windows the MTS files are supported natively with the Windows Media Player. On Macs Quicktime does not render MTS videos. Best to use a program like VLC (free) or Toast 10 Titanium (commercial product) to play MTS clips on Macs. This standard is still widely used (e.g. DVDs). 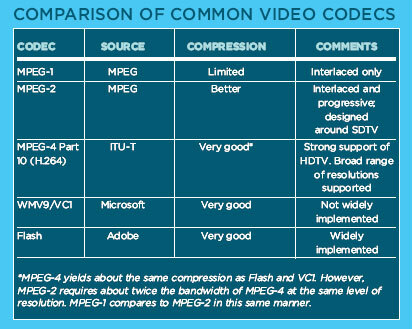 The compression is less efficient than MPEG-4 but also also less complex. MPEG-2 is often used in professional video cameras (e.g. Sony EX1 and some pro Canon camcorders). Codec by Panasonic that only stores I-Frames (this means no GOP sequences). The Red camera can record Raw data. This has many advantages in terms of image quality but also has to deal with massive data once the video clips are converted from Raw to standard Codecs. The actual data then get processed on the workstations (somehow like using Raw Converters for Stills). This Codec is often used in editing (with FinalCut Pro) but also can be native for the new high-end Arri ALEXA digital film camera (expensive new digital movie camera). During the editing process you want to preserve the data quality. Any quality lost during recording cannot be rescued but the data you got should not be degraded even more. GOP compression Codecs are not ideal for video editing although some editors seem to work fine with them. It is much better to use non GOP Codecs like the Apple ProRes Codec family for editing. We always transcode (read below) our clips from GOP Codecs to high quality non-GOP versions like Apple ProRes. This results in a much better handling of the video during editing but also adds an extra step in our workflow. Transcoding is the process of converting a video stream from one Codec to a different one or just to downsample the video. Transcoding to a lower quality (higher compressed Codec) should only be done as the last step to target your output device (Internet or Blu-ray). Editing in 720p is often easier on your computer system than using full 1080p. Even if we edit at 720p we still always shoot full 1080p footage because this shows lower artifacts (like moire and aliasing) and also allows us to use full 1080p if needed. If we record using H.264 or AVCHD in our cameras we transcode the footage to 720p Apple ProRes. This way we have a way smother editing process than using H.264 directly. We only convert part of our footage that we intend to use for editing because the file sizes get quite a bit bigger. Quicktime Pro 7 (QT 7): Can be bought for Mac and Windows at nominal cost. Note: Quicktime X that comes with Macs 10.6.x is less capable and does not work for transcoding. For the final rendering of your video for your target devices the H.264 compression Codec often will be used for both the Internet and Blu-ray. Your Blu-ray authoring tools will take care of the appropriate compression and Codec. Often for the Internet higher compression and some downsampling is applied.